Una Libra, Una Question! | Hello Neiman! Posted on March 15, 2009 by HelloNeiman! The road to El Dorado? So my parents asked me to help appraise and value a bunch of gold coins my grandfather had stashed away for years. Most are Hungarian, Austrian, or Mexican from the early 1900s. There is one coin I can’t find any value for anywhere on the internet. 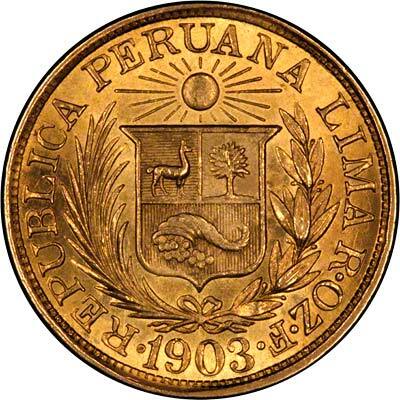 It’s a Peruvian “Una Libra” coin from 1903 that looks just like the above (with the date changed). This post is really just me venting my frustration in trying to get any value for it. Grr!! If any of you 15 readers are rare coin collectors, feel free to share your worldly knowledge. This entry was posted in HelloNeiman 1.0 and tagged Uncategorized by HelloNeiman!. Bookmark the permalink.